Just over a week ago, we hosted a webinar on Search Engine Optimization (SEO 101), led by Keith Brown, our Director of SEO. There were a ton of great questions and we thought responses to all of them would benefit all webinar attendees or readers of this post. Remember, the rules of the web change regularly so these responses are applicable for the foreseeable future (3-6 months). Due to the highly-interactive nature of the webinar with the audience, we are making the entire recording available for reference. Q: What was that website that tracks your SEO traffic? A: Google Analytics was mentioned many times throughout the presentation, which is a very useful free tool to track SEO, SEM, Social Media, Direct, and Referral traffic to your website. Q: Analytics, for the most part, are beyond the ability of the average Joe to measure. Which tools would you recommend for measuring SEO results? Or would you recommend using an analytics engine such as a product offered by GoDaddy? A: Don't let all the advanced features of Google Analytics overwhelm you, just focus on using a couple of key features. You can learn to track your daily traffic and monthly traffic in a few minutes, I'd recommend that as a great starting place. There are a ton of free tutorials and training online that can help you understand the basics. Other tools may seem simpler to use, but they rarely tell the whole story. The real value in measuring SEO results is in the analytics. Q: Can you explain Google Analytics? A: Sure, and this is a great follow-up question. Google provides a free analytical tool for website owners to monitor all aspects of their website. Installation of Google Analytics is very simple, and involves copying and pasting a snippet of code after you create an account. After you install the code, you are immediately tracking everything about the visitors to your website, from where they live, to how they search, to what part of your website they found most useful. Q: Is Wordpress a good format for a website or is html/css better, or does it matter in the "eyes" of Google? A: Wordpress is built using HTML/CSS so really it’s a question of what’s easier for you. For most do-it-yourself property management companies, WordPress makes it much easier than hand-coding an entire site. In general, Google see's the content on your page as more important than the way it is built. Q: How do I create a sitemap to index my website? A: There are plenty of free tools that will help you generate a valid sitemap. Google’s preferred format is an XML sitemap, but I've seen plenty of people use an HTML sitemap. An XML sitemap usually includes things like the page URL and how often it’s updated, while an HTML sitemap usually contains a list of the most popular pages. Q: How can your tell if your website has been indexed already? A: Google Webmaster tools provides a tool that shows you how many of your pages are indexed by Google. If you don't have Google Webmaster tools installed you can do a quick workaround by doing a search for your domain name. For example, if I wanted to check on the Propertyware website I would search “Propertyware.com” in Google and find it at the top of the search results. Q: Is our sub-domain site hurting us? A: This is a tricky question to answer without knowing more about how your sub-domain is set up, and what your goals are. The simple answer is that Google treats sub-domains like separate websites, so it's very unlikely your sub-domain is hurting your main website. The question I would ask is why are you using a sub-domain? In most cases it makes more sense to have all of your website content hosted on the same domain. To put it simply, it keeps all your "SEO" in the same place. Q: Is there an accurate and free page ranker key word check tool that you recommend? A: Unfortunately there is not one. Google makes sure that all of its searches and rankings are secure to protect our security. Any site you see that is offering this for free is likely to get shut down by Google eventually. There were many tools out there as recently as 2012, but in 2013 most companies went away from offering free services. Q: Is there a benefit to having multiple domain names that are very similar using zip codes, i.e. homes28303, homes28304, etc. all pointing to the same site? A: This is a technique that used to work well in the past, but has not worked well for several years now. Think of sending Google to a lot of different domains like this: when you go shopping, is it easier to go to ten different shops for ten different items or is it easier to go to one store and pick up those same ten items? The time spent by you, your customers and by Google could be basically spent more efficiently, and potentially with more impact if everything is in one place to begin with. Q: Can social media help my SEO efforts? Is social media important or not? A: Social media currently doesn't help SEO in a meaningful way, according to Google. There are numerous articles out there that quote respected Google fellows like Matt Cutts speaking about this very topic if you are curious to learn more. That being said, social media is still very important to your overall marketing plan. It allows you to learn more about your audience, find out their likes/dislikes, and cultivate local reviews. Social media can definitely help more of your SEO traffic convert into revenue, although it won't directly increase organic traffic by itself. Q: How do you get local reviews? A: First you ask your customer. Second, make it easier for your customers to find places to review you by posting links on your website to those specific places so they have the opportunity to review you. One of the biggest mistakes a local business owner can make with their website is not leveraging reviews with their overall marketing plan. Q: What do you mean by putting links in our websites for reviews? How does that help us? A: On your site, you could link to your business profile page on Yelp or Google or all the places someone could go to rate and review your service. Studies show that people are more likely to click a link directly to a reviews page vs them trying to find the reviews. This helps you because property managers often work on a referral basis, and reviews are just as good as somebody referring their friend to your business. Q: How do we give a link to a customer to give us a good review? A: A great place to do this is in a follow-up email or survey. Emailing them direct is best – they are now one click away from giving you a review. Don’t pay for a "good review" because that’s against Google’s Terms of Service. Please ask them to provide you with an honest review and make sure you are providing them with an amazing customer experience so that the review will be positive. Q: Can I add reviews to my Website from customer comment cards that Tenants and Owners fill out? A: Yes, you can add them. Best practice is to acknowledge the person’s name and the actual date of the review. Q: Is it okay for me to copy a Yelp review on my website even if I say" Here are some reviews from Yelp"...? A: You can certainly copy it, but it will not give you additional SEO value unless it’s original to your website and not copied from elsewhere. Q: Should the video be on our website or on YouTube? A: Both. YouTube is the best and most visible place to host your video, so I'd upload it there first. YouTube is also usually best for SEO, because after all Google owns YouTube. After it's uploaded and finished processing, share it as many places as you can, including your own website. Q: We have shifted the backbone of our linking strategy to links in Facebook posts. Is there a risk of being punished for a lot of links coming from a single source like Facebook, and is the rate of linking growth analyzed in the search engine algorithms? A: Links from Facebook drive traffic to your website, but most links on Facebook don't help your SEO. If you think about it from Google's perspective, they can't access your Facebook news feed because it's set to private. Facebook in many people's opinion is considered a walled garden or closed system. Basically, Google isn't welcome on Facebook for privacy reasons. In order to find the very links you are talking about building, Google would have to have access to everyone's private profiles on Facebook. That's not going to happen anytime soon. Q: How important is it for the content on your site to change frequently. How do we do this when most of our information is static? A: It’s very important given the ever-changing nature of the web and of users. As we've stated, changing your listings regularly is a great way to ensure you have fresh content. Updating images on pages with static text is also helpful. Q: How often should you update your site and how often is too much? A: As often as possible as long as its relevant and quality content. I'd recommend reviewing your website on a monthly basis, and updating where possible. It shouldn't be an everyday thing, one time a month is a great place to start. Q: How important are links to external sites? A: Links to external sites can be just as important as inbound links to your website. In the same way a website "casts a vote" in your favor with they link to you, you are improving your SEO by linking to quality websites externally. Good external links might include industry websites, trusted blogs and forums, and local resources for your customers. Q: Do the changes in properties being marketed count (new properties for lease/properties taken of as leased) as new content to Google? A: Absolutely. Anything that changes on a day-to-day or week-to-week is new content. Even you if you have older properties, you can still go back a few times a year and update your photography so it's "new" to Google. Q: How do you ensure your content is read by Google first when content is bound to be duplicated on third-party sites? A: Make sure you have a good amount of quality links coming from other websites and Google will visit your page often enough to read your content first. If your site has been around at least a few years, Google is likely visiting it several times each day looking for new content to index first. Q: If your content is copied by a third party site, what should you do or can you do? A: You have very little control about what others on the internet can and will do. Just know that 9 times out of 10, Google will not reward websites that copy your content. SEO isn't about the 1 out of 10 exceptions to that rule, but about forming stable long-term strategies. Over the long term, you will win, and the 3rd party copy cat will lose. Q: You touched on this... I heard that Google is moving away from SEO and is putting more weight in social media likes, shares, tweets, etc. Is this not the case? A: Google is trying to incorporate more signals into their search algorithm on a daily basis, and that includes everything from links, to fresh content, and even social media. Google will never "move away" from their core rankings algorithm which includes more than 200 unique signals. Also keep in mind that Google's largest competitor in the advertising space right now is Facebook. They don't want to reward their competition easily, so I'd expect Google to slowly add more weight to social signals over the next 3-5 years. This will not happen overnight, so don't overreact and shift away from building quality content and links. Q: We were told that in past 12 months Google dramatically increased the ratio of SEM screen space vs SEO screen space... so if you cannot come up in the top 1-5 organic results... should you not focus more on paying to show up in spots 1-3 of SEM space... SEO seems much more difficult to work your way up to the top. A: SEO is much more difficult in the short term, but it provides the best long-term value of any form of marketing online. SEM seems quick and easy, but can get very expensive very fast. Google has not dramatically shifted SEM ratios in the last 12 months, the last time they increased ad placements was several years ago. The data shows that the best Google strategy is a strong SEO/organic presence, combined with a very selective and ROI driven SEM campaigns. If you have a strong brand awareness, you need to be running both SEO and SEM to capture that valuable branded traffic online. The other things to keep in mind is that once you stop paying for SEM, you stop getting traffic. With SEO you can reap the rewards of increased traffic for years to come after optimizing your website. Q: What are the different levels of Google certification... for instance, our SEM company says they are a Google Certified "Premiere" partner. A: I would be wary of any company that touts their certification too highly. In many cases, a Google partner is based on how much money the partner spends with Google, and might not necessarily be a company that is the most knowledgeable in their field. When you are trying to determine the credibility of a company or partner, ask about previous clients they have worked with, what results they saw, and what their philosophy is on internet marketing. Certifications in the digital space are still not a very good basis for decision making, in my opinion. Google publishes a lot of great information on their partner program on their website if you want to read more. Q: What types of campaigns do you recommend utilizing for advertising? (Ex. facebook ads, etc. Any you recommend avoiding? A: This question touches on SEO, SEM and long term ROI. Obviously the best place to start is by optimizing your website for SEO or organic search, because it will improve your SEM, Facebook ads, or anything else you plan to utilize at a later date. There are plenty of great advertising platforms out there, and depending on your audience they all have your use. If you are just beginning your online advertising, I would stick to the major advertising players like Google Adwords, MSN/Bing Adcenter, and Facebook ads. Facebook ads are still in their infancy, so you be sure you do your home work before wasting a bunch of money on them. Q: Will Google increase SEM results making SEO less relative? A: Google is always looking for ways to increase their revenue, and they do this through optimizing their sale of of SEM ads. Still, there is a fine line Google walks between SEO and SEM. If they put too many SEM results on a page, studies show that visitors to Google are less happy with those pages. The SEO is what makes Google a credible search engine, because when people do a search on Google they want the best SEO results on the first page, not just the ones people paid the most money for in SEM. 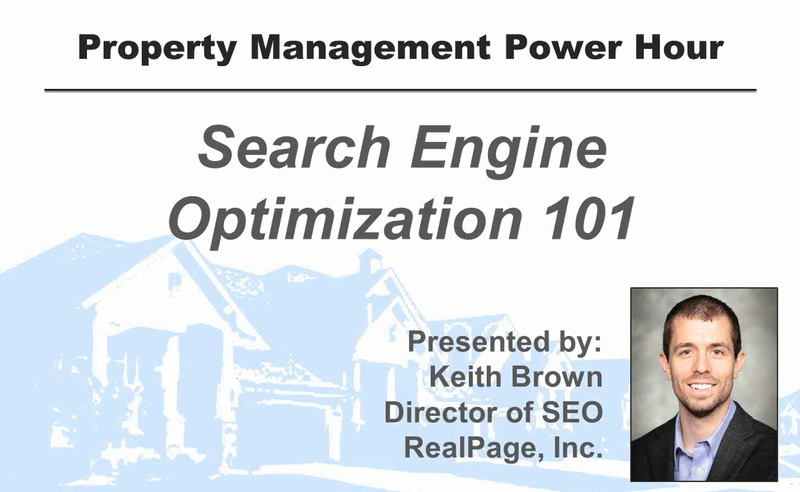 Thank you to those who attended our SEO webinar, and for stopping by the Propertyware blog today. Blog comments are the best way we can determine how useful these posts are, so if you found any of these questions or answers useful please let us know by leaving a comment below.